Mohamed A. El-Erian is Chief Economic Advisor at Allianz, the corporate parent of PIMCO where he formerly served as chief executive and co-chief investment officer. He is a columnist for Bloomberg View, a contributing editor at the Financial Times and serves on several advisory committees and boards. Dr. El-Erian first joined PIMCO in 1999 and was a senior member of PIMCO’s portfolio management and investment strategy group. He rejoined the company at the end of 2007 after serving for two years as president and CEO of Harvard Management Company, the entity that manages Harvard’s endowment and related accounts. Before coming to PIMCO, Dr. El-Erian was a managing director at Salomon Smith Barney/Citigroup in London and before that, he spent 15 years at the International Monetary Fund in Washington, D.C. where he served as Deputy Director before moving to the private sector. Dr. El-Erian served as Chair of President Obama’s Global Development Council from December 2012 to January 2017. He has published widely on international economic and finance topics. His 2008 book, “When Markets Collide,” was a New York Times and Wall Street Journal bestseller, won the Financial Times/Goldman Sachs Business Book of the Year and was named a book of the year by The Economist and one of the best business books of all time by the Independent (UK). He was named to Foreign Policy’s list of “Top 100 Global Thinkers” for four years in a row. Since 2014, he has been serving on the jury for the Financial Times/McKenzie Book of the Year award. His latest book, published in January 2016, “The Only Game in Town: Central Banks, Instability and Avoiding the Next Collapse,” is a New York Times bestseller. 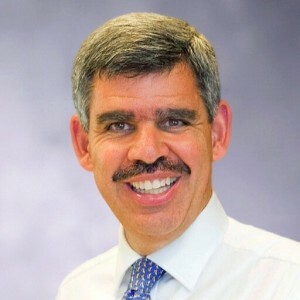 Dr. El-Erian has served on several boards and committees, including the U.S. Treasury Borrowing Advisory Committee, the International Center for Research on Women, the Peterson Institute for International Economics, the Carnegie Endowment for International Peace, the IMF’s Committee of Eminent Persons and the New York Fed’ Investor Advisory Committee on Financial Markets. He is currently a board member of Under Armour, the NBER (Executive Committee), Berggruen Institute (Executive Committee), KAUST and other educational institutions. In 2018, he was just appointed to the IMF’s External Advisory Group on Surveillance and MIT’s Visiting Committee for the Department of Economics. He is a member of the Council on Foreign Relations, the Investcorp external committee and government advisory committees. Since 2007, he has been chair of Microsoft’s Investment Advisory Board and co-chairs the Capital Campaign for the University of Cambridge and its Colleges.. Recognized for his philanthropic contributions, particularly in the areas of education and health, Dr. El-Erian has received several awards, including lifetime achievement from the 57357 Hospital for Children/Egyptian Cancer Network where he is the Honorary Chair. Other recognitions include the ABNA, Arab Banker of the Year, ACCESS Arab-American of the Year Award, Africa Investor’s Capital Markets Personality of the Year, Fixed Income Analysts Society’s Hall of Fame, Foreign Policy’s “Top 100 Global Thinkers” (4 years in a row), Investment News’ “Icon and Innovator,” Linked-In top 3 “voices” among its “influencers” (2016 and 2017), Louise Bloin Foundation Creative Leadership Award, Middle East Institute’s Visionary Award, Orange County Business Journal’s most influential personalities (multiple times), Ukleja Center’s Nell and John Wooden Ethics in Leadership award, and Worth magazine’s “100 Most Powerful People in Finance” (multiple years). Dr. El-Erian holds a master’s degree and doctorate in economics from Oxford University and received his undergraduate degree from Cambridge University. He is an Honorary Fellow of Queens’ College, Cambridge University. 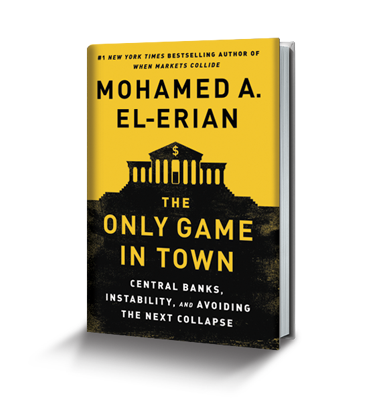 Dr. Mohamed A. El-Erian, one of the world’s most influential economic thinkers and the New York Times and Wall Street Journal bestselling author of When Markets Collide, has written a roadmap to what lies ahead and the decisions we must make now to stave off the next global economic and financial crisis. Our current economic path is coming to an end. The signposts are all around us: sluggish growth, rising inequality, stubbornly high pockets of unemployment, and jittery financial markets, to name a few. Soon we will reach a fork in the road: One path leads to renewed growth, prosperity, and financial stability, the other to recession and market disorder.